February 24, 2010: The Night of Problematic Circuitry and Two Parsnip Soups. I’m tempted to just leave it at that. I mean, doesn’t that say it all? No? You want the juicy details? We had a healthy — and hungry — turnout this week, which was a good thing since I apparently forgot how to count and not only lined up seven soup cooks but decided to get in on the soup action myself. I had some leftover La Farine ciabatta from last week, so on Wednesday morning I set to work on a pot of Gabe McMackin’s pappa al pomodoro soup, which was a big hit in Brooklyn. It’s ridiculously easy. Stale bread + canned tomatoes + stock. Season liberally with garlic, basil, jalapenos (picked from the yard in September and frozen till now), and lots of Parmegiano Reggiano. So good! Jeanelle Hayner‘s parsnip-caraway soup with turkey, caraway, and tarragon meatballs. Jeanelle was worried about how this would turn out — she even sent me a message Wednesday afternoon preemptively apologizing for bringing “frankensoup.” But (once we got it heated up) this was terrific, a judicious balance of sweet (roasted?) parsnips, slightly bitter caraway, and light, mild turkey. John McKevitt owns the Kewaunee Inn, on the lakefront in beautiful (der) Kewaunee, Wisconsin. His cheddar-beer soup was a strong showing for the flavors so dear to our neighbors to the north. He sent the recipe already so I should have that up soon. Here’s the recipe. Next up was Ryan Cooper, from First Slice. She brought an awesome vat of VEGAN butternut squash chowder, packed full of kale, red onion, carrots, and Great Northern beans. She’s probably busy this week, getting ready for next week’s Empty Bowls event (where Soup and Bread will have a little table) but hopefully she’ll have a moment to pass along her cooking secrets as well. Painter and cooking instructor Won Kim couldn’t choose a topping, so he brought along chives, fresh leeks, caramelized red onions, and (of course) bacon as garnish for his rich, creamy potato-leek soup. Novelist Terri Griffith tapped into her years as a cook in Everett, Washington (PNW represent! ), to turn out a hearty, spicy black-eyed pea, kale, and chorizo soup. She’s already got the recipe up on her blog over here, but I’ll have it here it is on the soup site soon as well. Librarian Laura Scott not only turned out a tomato-basil soup packed with sunny flavor, but she let me borrow her camera to boot. I promise by next week I will have purchased a new camera, because this is getting ridiculous. And, holding down the other end of the soup line, was Green Earth Institute farm manager Martin Lemos with parsnip soup #2 — this one a rich, thick, nutty puree shot through with maple syrup. Firm it up and frost it, and you’d have a big bowl of parsnip candy. Mmmmmm. And … that was all, though we also had, of course, more bread from La Farine plus baguettes, three pies, and several boxes of scones courtesy of Rae Hill and Chef Kraus’s baking class. Thanks again to all the cooks for their great contributions, and their patience dealing with the cramped quarters and the power strip that shut off the heat there for a while. With their help — and yours — we raised $493 for First Slice. We are packing them in next week. This weekend’s to-do list: Buy more crock pots. Proceeds from next week’s Soup and Bread benefit First Slice, the independent hunger relief organization founded by onetime North Pond chef Mary Ellen Diaz. First Slice provides home-cooked, restaurant-quality meals to about 100 men, women, and children a week; it’s unique in that it is, for the most part, self-funding. Those with means can subscribe to First Slice’s shareholder program. Much like a CSA, a share in First Slice nets the shareholder a hot, high-quality, home-delivered three-course meal each week — but the money from each share also goes to pay for an equal meal for a person who can’t afford it on their own. I’ve long been a fan of First Slice’s philosophy, which extends the same menu — the “first slice” of the pie, rather than the crumbs — to shareholders and clients alike. We’re going to have a Soup and Bread table at Lillstreet Art Center’s Empty Bowls event on March 5, a terrific fundraiser benefitting First Slice, which also runs a cafe in the Lillstreet building. And, in return, this week, First Slice is bringing soup. I think Ryan Cooper, from First Slice, said something about corn chowder, but don’t hold me to that. Back for a second go-round, Graficionada‘s Jeanelle Hayner. Here’s what she had to say about her Soup and Bread turn last year. Green Earth Institute farm manager Martin Lemos, of red onion soup fame. Painter, DJ, and Whole Foods chef/instructor Won Kim. Librarian and book blogger Laura Scott. Novelist, Parlor reading series co-director, and 250 Potato Possibilities blogger Terri Griffith. John McKevitt, of the International Volunteer Network of Chicago. That’s all, I think. 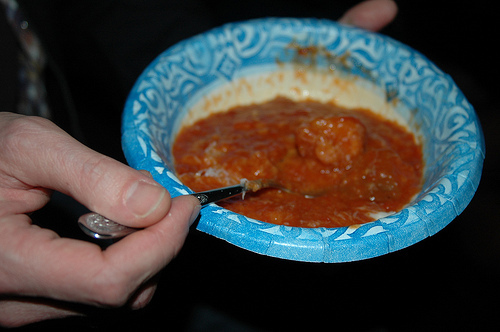 Unless I decide to try my hand at that pappa al pomodoro soup everyone’s so excited about [see photo]. I do happen to have lot of stale ciabatta lying around…. Come by on February 24 and see for yourself what they come up with. 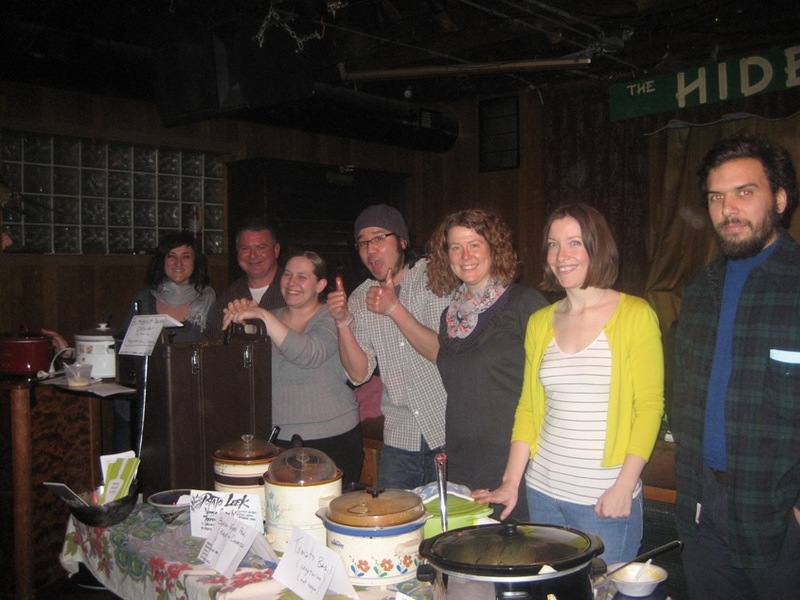 Soup and Bread happens from 5:30 to 8 PM at the Hideout, 1354 W. Wabansia. And, you might want to stick around for a while. Later that night: Peter Brotzmann!